An estimated 2 million Hispanics of Cuban origin resided in the United States in 2013, according to a Pew Research Center analysis of the Census Bureau’s American Community Survey. 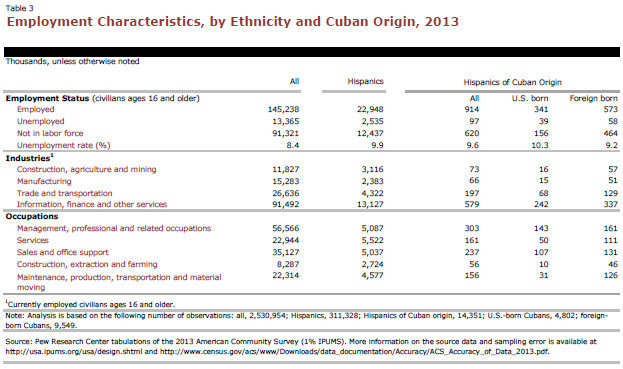 Cubans in this statistical profile are people who self-identified as Hispanics of Cuban origin; this means either they themselves are Cuban immigrants or they trace their family ancestry to Cuba. Cubans are the third-largest population of Hispanic origin living in the United States, accounting for 3.7% of the U.S. Hispanic population in 2013. Immigration status. Nearly six-in-ten Cubans (57%) in the United States are foreign born, compared with 35% of Hispanics and 13% of the U.S. population overall. Almost half of immigrants from Cuba (47%) have been in the U.S. for over 20 years. 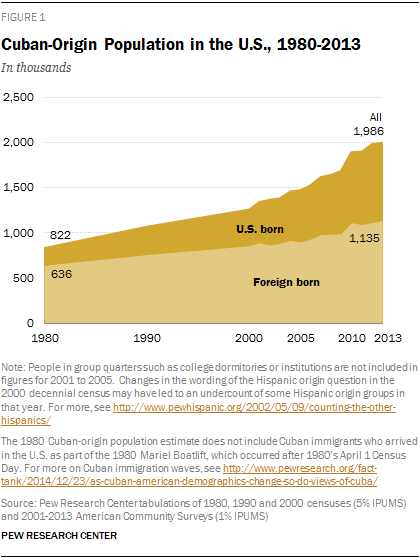 About six-in-ten Cuban immigrants (59%) are U.S. citizens. English proficiency and speaking Spanish at home. According to the ACS, a majority (60%) of Cubans ages 5 and older speak English proficiently.2 The other 40% of Cubans report speaking English less than very well, compared with 32% of all Hispanics. Overall, some 79% of Cubans speak Spanish at home, higher than the share (73%) of all Hispanics ages 5 and older who speak Spanish at home. Bilingualism and language dominance. According to the 2013 Pew Research Center survey, some 13% of Cubans are English-dominant, lower than the share of Hispanics overall (25%).3 About half of Cuban adults (51%) are Spanish-dominant, and roughly one-third (36%) are bilingual. The share of Cuban adults who are Spanish-dominant is higher than the overall Hispanic population (38%) and the share of bilingual speakers is equal to the overall Hispanic population (36%). For Cuban immigrants, about six-in-ten (61%) are Spanish-dominant, while about one-third (35%) are bilingual. Only 4% of Cuban immigrants are English-dominant. Age. Cubans are older than the U.S. population and Hispanics overall. The median age of Cubans is 40; the median ages of the U.S. population and all Hispanics are 37 and 28, respectively. Among Cubans, the median age of immigrants is 51 years, while it’s only 22 years among the U.S. born. Marital status. Cubans ages 18 and older are just as likely to be married as Hispanics overall (46% of each)—while half of the U.S. population is married. Among Cubans ages 18 and older, the foreign born have higher rates of marriage than those who are U.S. born—50% vs. 36%. Fertility. Some 5% of Cuban women ages 15 to 44 gave birth in the 12 months prior to this survey. That was slightly less than the rate for all Hispanic women (7%) and the overall rate for U.S. women (6%). Regional dispersion. Cubans are the most geographically concentrated of the 14 largest Hispanic origin groups—78% live in the South, and 68% live in Florida. Educational attainment. Cubans have higher levels of education than the U.S. Hispanic population and somewhat lower levels than the U.S. population overall. One quarter of Cubans ages 25 and older—compared with 14% of all U.S. Hispanics and 30% among the U.S. population—have obtained at least a bachelor’s degree. Among Cubans ages 25 and older, the U.S. born are more likely to have earned a bachelor’s degree or more than foreign-born Cubans—36% vs. 21%. Income. 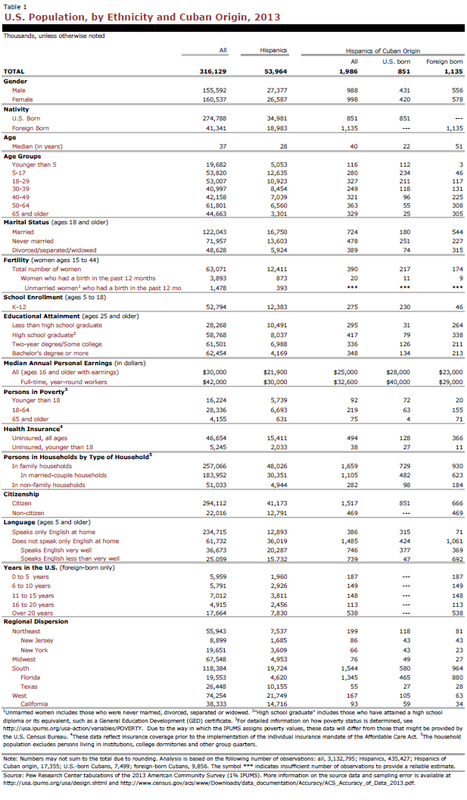 The median annual personal earnings for Cubans ages 16 and older was $25,000 in the year prior to the survey—greater than the median earnings for all U.S. Hispanics ($21,900) but lower than the median earnings for the U.S. population ($30,000). Poverty status. The share of Cubans who live in poverty, 20%, is higher than the rate for the general U.S. population (16%) but lower than the rate for Hispanics overall (25%). Homeownership. The rate of Cuban homeownership (55%) is higher than the rate for all Hispanics (45%) but lower than the 64% rate for the U.S. population as a whole. “Cuban” is the identity term used most often. When asked in a 2013 Pew Research Center survey what term they use to describe themselves most often, a majority of Cuban adults (63%) say they most often use term “Cuban.” About two-in-ten (19%) say they describe themselves most often as “American.” Only about one-in-ten (11%) most often use the pan-ethnic terms of “Hispanic” or “Latino” to describe their identity. By comparison, 54% of all U.S. Hispanics say they prefer their ancestor’s Hispanic origin term to describe their identity, 23% say they describe themselves most often as “American” and two-in-ten use the pan-ethnic terms of “Hispanic” or “Latino” to describe their identity. Preference for Hispanic or Latino. In regard to the pan-ethnic terms of “Hispanic” or “Latino,” about half of Cuban adults (51%) have no preference for either term. Among those who have a preference, more prefer the term “Hispanic” (29% of all Cubans), while some 19% prefer the term “Latino.” By comparison, half of all Hispanic adults have no preference for either term; among those who do have a preference, Hispanic is favored over Latino 2-to-1. Typical American or not. When asked in the 2013 Pew Research survey whether they thought of themselves as a typical American or very different from a typical American, 55% of Cuban adults see themselves as a typical American, while about four-in-ten (37%) think of themselves as very different from a typical American. By comparison, Hispanic adults overall are less likely to think of themselves as typical Americans (49%) compared with Cubans, and on balance Hispanic adults are more likely to see themselves as a typical American (49%) than very different from a typical American (44%). Religious affiliation. A 2013 Pew Research Center survey of Hispanic adults finds that about half of Cuban adults (49%) identify themselves as Catholic. Roughly two-in-ten (17%) Cubans are Protestant, and among all Cubans, 8% are mainline Protestants and 8% are evangelical Protestants. About one-quarter (26%) of Cuban adults are religiously unaffiliated. In contrast, among all Hispanics 55% identify as Catholic, 22% identify as Protestant, and about two-in-ten (18%) are unaffiliated.